The news today reports that Thorarinn Ingi Jonsson, an "artist" in training at OCAD, didn't expect people to react to his fake bomb, which he claims is a sculpture. Jonsson said yesterday he never expected the final piece in his art project to result in such an “overreaction”, since he left a note on the suspicious package indicating it was not a bomb. What does he think the police should do when they find a bomb? Assume it's ok because it says it isn't a bomb? The Toronto Star reports that Jonsson dialed the ROM's phone number, punched in a random extension, and then told the person that answered the phone that "There is not a bomb by the entrance of the museum". So that should be enough? Mr. Jonsson has been suspended from school and arrested and charged with mischief and nuisance. Hopefully he'll spend some time in jail and will learn that he should think before he acts. He'll probably claim that he did think ahead, and he'll tell you how "he consulted with a lawyer from the student union before he went ahead with his project." Maybe, for good measure, they should throw that lawyer in prison too. Yes, it's true: This remarkable device plugs into that incredible power-plant under your desk, also known as a PC, and vacuums up anything in reach of its magnificent 1200mm-long cable. 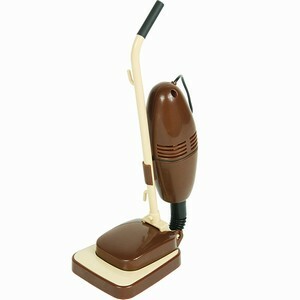 The LEGO bricks on my desk thought they were safe from their natural predator, the rug-cleaning vacuum. Now they live in fear of their new, miniaturized, USB-powered predator. * Technically this won't fill any existing voids... in fact it works by creating a new, tiny void, in a sense. But then it puts dirt into that void... leaving you with no net change in voids. I've mentioned in past posts how absurd I think the LEGO prices are in Canada. Lately, with the Canadian dollar skyrocketing, the price difference for a LEGO kit is approaching 40% in real terms. This means that, considering the dollars are about at par, a LEGO kit that sells in the US for $99.99 sells in Canada for $139.99 MSRP. Some places will have this kit for $129, others $149. I recently discovered that Barnes and Noble.com sell LEGO and it appears they ship to Canada. If so this makes them one of the only major online retailers that do so. But this means we can finally prove to LEGO Canada that, while their product is awesome, their pricing policies are beyond ridiculous, and as a customer I am insulted they they feel they can gouge so much. I mean, we're not talking about a simple 5-10% difference, the kind you can hand-wave away as import tax or duty related. We're talking about simple gouging. The last few years, with the Internet in practically every home, people have been able to see the prices that their neighbours are paying. And more and more we're able to pay those prices too. Dear Canadian retailers who sell LEGO: Your customers will abandon you to shop at your US rivals. I'm talking to you, Toys R Us Canada, and you too, Chapters/Indigo. Your prices don't make sense anymore. And if a US firm will ship me the same product for way less than you will, why SHOULDN'T I buy it there? Please, do your part and contact LEGO and tell them to get their act together. Incidentally this rant also applies to you, Future Shop and Best Buy. How come I pay $30% more video cameras in Canada? It's bogus, and your customers won't stand for it either. When a Canada Post sponsored website can hook me up with a US vendor who'll sell me the same product as you, delivered to my door, taxes and duty INCLUDED, and it's still WAY cheaper than you, something is wrong with your business. I urge my Canadian brethren to vote with their dollars and buy American if that's what it takes to get lower prices here. Enough is enough. Stockwell Day, Canada's Minister of Public Safety, can't understand why people are more outraged over the death of a Polish immigrant at the hands of police compared to the deaths of people in traffic accidents caused by drunk or dangerous driving. I'll give you a hint: on one hand, we have normal everyday assholes who drive badly. On the other hand, we have the FREAKING POLICE, the government's ARMED sqaud of enforcers, killing innocent people. It doesn't take a rocket scientist to think that, if the government can just walk up to you and kill you, maybe something is wrong with the world? Not to mention that dangerous drivers and drunk drivers still get tiny, meaningless sentences. Frankly my personal outrage for drunk drivers is waning, because I've been outraged about it for so long. Recently a man was jailed for 3 years for killing a dog, which is the same sentence as someone received for killing a person while street-racing. Mr. Day, I can assure you that this DOES outrage me, and your government hasn't done enough to punish the perpetrators of driving murders. But I have to draw a line and say that the police's over-zealous use of tasers, resulting in needless death, is outrageous in the extreme. The statistics are frightening: from 2002-2005 (the latest year the data is available) over 79% of RCMP taser-victims were unarmed at the time. What's wrong with this picture? we know that four sugar pills a day will clear up ulcers quicker than two sugar pills, we know that a saltwater injection is a more effective treatment for pain than a sugar pill, we know that green sugar pills are more effective for anxiety than red, and we know that brand packaging on painkillers increases pain relief. I guess that explains why my parents insist on buying the name-brand headache pills, despite their pharmacist's re-assurances that the generic brand is just as good. This is an understatement: a 30C homeopathic preparation is a dilution of 1 in 100^30, or rather 1 in 10^60, which means a 1 followed by 60 zeroes, or - let’s be absolutely clear - a dilution of 1 in 1,000,000,000,000,000,000, 000,000,000,000,000,000,000,000,000, 000,000,000,000,000. Last time I discussed learning Mandarin I mentioned a few things about characters. Today I'm talking about tones. In Mandarin there are 4 tones (or 5 if you count the 'neutral' tone). The tones are numbered 1 through 4 and represent the pitch of the word. The first tone is high pitch, the second tone is rising, the third tone is falling-rising, and the fourth tone is falling. Tones are very important because there are lots of words that are indistinguishable except for the tone. The classic example are the words mā (媽) and mǎ (馬). The first word means mother and the second means horse. The first word is pronounced with the first tone while the second is pronounced with a 3rd tone. This musicality is the only way to distinguish between the two words when spoken in isolation. In a complete sentence, you can sometimes guess the word based on the context, but it can be unclear. If you mispronounce the middle word, using the 3rd tone instead of the 4th tone, wèn (問) becomes wěn (吻), which changes the sentence to "Please kiss me". While this could be an extremely useful phrase, using it in the wrong situation can lead to problems. 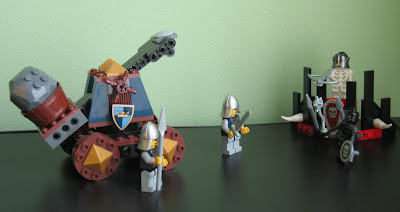 The last set I bought in the 2007 Lego Castle line is the 7091 Catapult Defense. 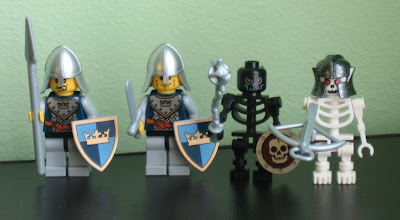 This set is comprised of two knights with a catapult attacking a skeleton fortification "manned" by two skeletons, one white and one black. This set is notable for the inclusion of the black skeleton figure, who helps provide a little variety for your legion of undead warriors. It's not clear WHY the skeleton is black, perhaps he's been burned, or maybe it's the evil magic that animates his emancipated corpse, but most likely it's just that he tested well with the focus groups. The good guys in this set are two generic soldiers, one armed with a spear and the other a sword. As always, the swords used by the good guys are the classic broadsword design (other sets in the series sometimes use the greatsword), which is one of the most key improvements LEGO made in this series: axing the new "zword" and returning to the, dare I say, perfect sword of ages past. The bad guys are armed with a morningstar and crossbow, but their fortification also has spears and spikes on it. However if the good guys manage to land a rock on it from the catapult, that puny wall won't hold up. This set is a good mix of figs and parts, for a decent price. The catapult is well built, and contains a minimum of useless pieces. The parts can be re-used to make a serviceable wagon (though you'd need a horse from another kit). The barricade itself is rather small, really more suited as an attacker's hastily-erected defense rather than the defender's main wall, but it serves the purpose of giving the catapult something to smash. The only thing that would have made this set better (aside from gobs of minifigs) is if the fortification were a little more substantial; growing up with a brother has sensitized me to unbalanced toys where one brother gets the "bigger half". If the fortification had twice the pieces it would be a serious opponent to the catapult and would lead to a good split for two brothers to share. Overall this set is worth buying but it isn't as good an army builder as the crossbow cart, however you do get shields and swords for your soldiers which is always welcome. So, let's pretend you're a pool-slide salesman. Say someone has a pool in their backyard. This pool isn't very deep. Now say they buy a used slide from someone else (not you) and install it. Then they call you up asking for replacement parts for their slide. Then later on someone is injured while using this slide, because they installed a slide in a shallow pool and people were using the slide incorrectly. Whose fault is it? If you said "mine!" you're right, according to the Ontario courts. You read that correctly: the store that sold PARTS for the slide, but not the slide itself, was held 80% liable for the tragic accident that paralysed a 15 year-old girl. The girl was held 20% liable because she slid down in a crouched position, despite her mother telling her to slide down "on her bum". A link to the Ontario Appeals Court judgement is here. In it the judge notes that the trial found that in several cases the pool owner asked if it was "okay" to install the slide or if there would be any problems. Several people at the pool store told her there would be no problems. He also notes that the instruction label on the slide had become faded and worn, which is not surprising considering that the slide was purchased used and was over 15 years old. These factors aside, the judge's decision to hold the pool store liable was based on the fact that the woman who bought the slide trusted the pool store staff to provide safety instructions regarding the use of the slide. According to the judge, it's not obvious that slides pose a danger, and so when the pool store staff said "no problem" about installing the slide, what they should have said was "no problem but always go down feet first or you may be paralysed". Despite the fact that she didn't specifically ask for any safety advice, the court found that it should have been obvious that safety was her only concern, so the store staff should have advised her as to the pertinent safety rules. What this means is that anyone who is potentially an expert on any topic is liable for the accidents that befall others. If a court feels you represent yourself as an expert in some capacity, and a person asks you for advice, you are legally responsible for the advice you give. Thus a pool store is responsible for advising anyone who asks a safety question; if they answer the question they are now responsible for anything that happens as a result of that answer. The legal test mentioned in the decision is the "but for" test. "But for" the advice given to the woman, she wouldn't have bought the slide. That is, if the pool staff had said "don't buy the slide", or "don't install it", she wouldn't have installed the slide, and thus her daughter wouldn't have been injured. This, combined with the fact that the woman trusted the pool store staff as experts, means that the store is responsible for any injuries that result on account of their "advice". I guess if you work in any industry where there is even the remotest possibility that you will advise someone in some aspect where there is some safety factor, you'd better have lots of insurance, or else just keep your mouth shut. A man was recently sentenced to 3 years in jail for throwing a dog out a window, causing serious injury to the dog which required that it be put down. Now, this man is clearly a jerk who deserves to spend some time in jail. But my problem with this is that his sentence is longer than some drunk drivers receive, even when people have been injured or killed. Frankly this shows that the courts need a major cleanup to improve law and punishment consistency. Today I wanted to say thank you to my grandfather and all those who served in World War II and any of Canada's other wars. There are those in society who take it for granted but the sacrifices made by our young men are of immeasurable value. The wars leave our youth killed or injured; my grandfather was relatively lucky in that all he physically lost was his teeth, but he never spoke about the war and you could tell that he'd been through some hardships. Today our men and women are serving in the Middle East, fighting an unpopular war. I don't know enough about the situation in Afghanistan but I hope history shows that our presence accomplished some good. So to all our soldiers and veterans: Thank you for your hard work and your sacrifices. They have not been in vain and will not be forgotten. 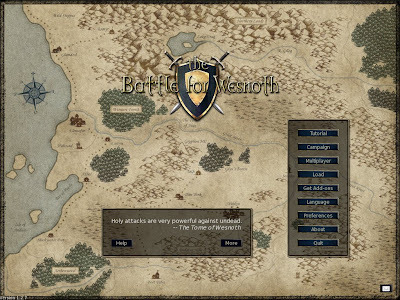 I've discovered a new drug: The Battle for Wesnoth. This is a Free Software game which is available for Windows, Linux, Mac, and many other platforms. 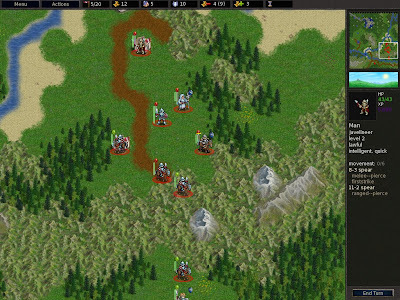 It's a turn-based strategy game with both single-player and multi-player modes. The gameplay is very simple: you have a bunch of soldier units which can move along the hexagonal grid. Your units have various characteristics, such as different kinds of attack and defense, magic, flight, speed, or other traits, and you must use these traits to defeat an enemy or capture a position on the map. There are other nuances, such as characters who work better in the day or in the night, and most importantly, characters who work better on different kinds of terrain. As your characters defeat enemies they acquire experience and advance to new ranks. You can recruit more units by getting gold, which you get when you occupy a village. With these simple rules the gameplay is easy to pick up, even for a novice such as myself, but the games are quite entertaining. There are a number of single-player campaigns and there is also a multi-player mode. What's most interesting about this is that this game is completely Free. You can download the code, artwork, and music, and modify or re-use it in other Free programs. This is rare in the world of games, especially for such a high-quality game. The other day I was playing the game when I realized it was almost time to get up and go to work. That sort of thing hasn't happened to me in a long time and is a testament to the addictiveness of this game. You know, I never understood the vampire on Sesame Street. I'll admit it: the pun was lost on me. To me he was a vampire, like Dracula. Sure, Dracula's "title" was "Count" but that's just a label the nobility have, like Baron or Duke. 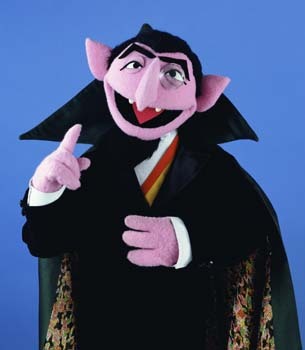 I never wondered what kind of noble the vampire on Sesame Street was, and it never occurred to me that he counts things because he's a Count. I didn't figure this out until years later, when a friend's band (Chucky Jenkins and the Psychedelic Caterpillars) wrote a song about how scary Sesame Street was. In the song they mentioned the purple vampire counting everything in site, and it was only when I said, "What was that vampire's name?" that everyone laughed and I realized what a dumb kid I'd been. Anyway, it turns out that our favourite blood-sucking muppet isn't the only vampire that suffers from OCD. Did you know that Vampires can't resist counting seeds if they find them on the ground? Simply spreading a bunch of seeds around a vampire's grave keeps them occupied all night counting the seeds, which leaves them no time to come terrorizing your village. So you can add one more bullet to your list of how to recognize a vampire: they obsessively count things. It's really true that everything you need to know you learned from Sesame Street.